Carlton Ware Pattern & Shape records - stolen patterns. Pattern and shape records are important documents for any working pottery and are closely guarded, not least from a competitor. The information that pattern records hold, such as decorating techniques, colours and glazes used for each decoration enabled the pottery to maintain standards and be consistent. When patterns and shapes become obsolete this importance lessens and sometimes such records are discarded or lost. This was the case with Carlton Ware's early shape and pattern records for ware made between 1890 and c1911, when Blushware reigned. Fortunately, pattern records had survived from the date that Horace Wain joined the pottery shortly before World War One and many shape records had also escaped loss. Such documents enable a much clearer history of a pottery to be revealed. The article below, which was first published on our Latest News page in November 2010, chronicles the sad demise of Carlton Ware's pattern records after they were sold along with the trade mark in 1989, though the cloud of the story has a silver, or should we say gold printed, lining! When Peter Cochrane and I first visited the Carlton Ware works in the early 1980s, we were concerned to find that pattern and shape books were kept in the open in the general office from where they could easily	have 'disappeared'. Because of their historical importance, we persuaded Anthony Wood, who then owned the pottery, to store them in an office safe. Whilst the books were not in use, here they were kept until receivership in 1989, when they and the Carlton Ware trade mark were sold to John McCluskey. The books were taken to Mr. McCluskey's works in near by Stone, once again to be stored in the office, but this time not in a safe. In 1992 John called to tell me that the pattern book had been stolen and that police had been called. Various suspects were interviewed but the book was not recovered. Fourteen years later, an extraordinary coincidence occurred. Helen Martin, who did freelance work for Mellors & Kirk, received a phone call from the saleroom to be told that some pattern records, thought to be from Carlton Ware, had been brought in for valuation. As a leading expert on Carlton Ware, Helen was asked by her employer to advise. Having known of the original theft, with camera at the ready, she drove over to the rooms to investigate, hopeful that the stolen book had surfaced. However, there was no book but instead twenty five sheets of designs. Helen dutifully photographed the records and emailed them through to me. Were they from the missing book or not? How would we be able to tell? Oh dear! If they were, then they had been torn out of the book! One of the first things that Peter Cochrane and I did on our frequent visits to Copeland Street was to photograph the pattern and shape books. These were pre-digital days, so we had to use film, a lengthy but necessary task and one that, as we shall see, would eventually pay dividends. Because of our photographs, I was able to compare our images with those that Helen had taken. One particular picture would identify them one way or the other. 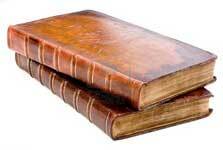 It showed a tear and if this matched then the pages had been removed from the stolen book. I called John McCluskey straight away only to find that he was in Australia. Fortunately, we managed to track him down but his stay in Oz was to be lengthy. Consequently, he appointed us to act as his representatives and we contacted the police. The pattern records were duly confiscated to be returned to the rightful owner on his return to the UK. With little persuasion, John agreed to donate them to the Potteries Museum & Art Gallery and this is where they are today for all to see. Team work - there is nothing to beat it! How fortuitous and indeed miraculous that the pages were taken to the saleroom for which Helen worked, making it possible to identify them as stolen and returned to their rightful owner. Violet Elmer and Rene Pemberton, whose work they illustrate, must have been guarding them! Had they been taken to another saleroom, we may not have discovered them and so they could have disappeared again. The sad part of the story is that the recovered pages represent only ten percent of the book. Inevitably, it is the most photogenic records that were removed. Will the remaining records surface? We wait for the phone to ring! © Harvey Pettit 2010. If you know of the whereabouts of the remaining records you can contact or in complete confidence and with no questions asked and we will see that they are lodged with the Museum. 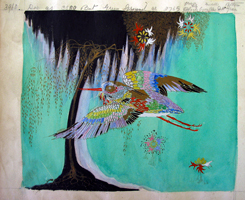 We would like to thank Helen Martin for her pictures of the stolen pages, as well as The Cochrane & Pettit Archive of Carlton Ware. 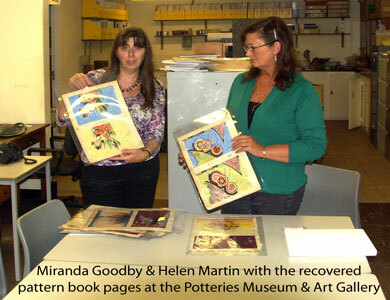 Also Miranda Goodby for permission to use the photograph taken at the Potteries Museum & Art Gallery. Last but not least, thanks to Anthony Wood for allowing us access to the original books all those years ago. Images by Helen Martin & Harvey Pettit © Copyright 2011. All rights reserved.